Stylish teens, look no further. JCPenney has a great selection of juniors' graphic tees to help you make whatever statement you wish at a price you can afford. Are you into adventure movies? You'll find your favorite action hero tee here. Do you enjoy making your friends laugh? Try one of the funny graphic tees that will have your friends rolling in laughter. Are you looking to make a social declaration? Show it by wearing one of the statement graphic tees offered by JCPenney. No one will ever accuse you of having a boring wardrobe when you choose to shop at JCPenney. You'll discover a vast selection of colors in solids and allover prints so you can pick your most flattering hues and designs. In addition to having whatever colors and prints you prefer, JCPenney offers a variety of images and expressions with character tees. Enjoy showing off your favorite comic strip character to everyone who sees you. Do you have a favorite hobby or pastime? Announce your passion to the world. Are you a world traveler? You'll find some cute sayings that might – or might not--need interpretation. JCPenney offers a wide range of T-shirt styles so you can be comfortable all day. You'll find long sleeve, three-quarter sleeve, short sleeve, and sleeveless tees for whatever the weather brings. Do you like crewnecks or V-necks? We have both. We also offer a variety of other necklines, including some that lace at the top or have a peekaboo cutout for an extra dose of styling. 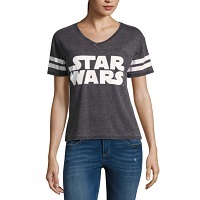 Whether you prefer cropped, traditional, or tunic length tees, you'll discover that JCPenney has them. Wear them tucked in, leave them out, or make a knot to suit your personal style and comfort level. Most of these graphic tees will go with a variety of bottoms – from jeans to dressy pants and skirts – to create different and unique outfits. Whatever way you want to wear them is totally up to you. Are you buying gifts for special teens in your life? All you need to know is their favorite movies, cartoons, video games, or hobbies, and you'll have a great place to start. JCPenney has such a wide range of pop culture graphic designs the most difficult part of the shopping experience will be narrowing down your selection. Imagine the look of surprise and joy after the unwrapping as they see that you got it right. JCPenney is proud of the fact that we can offer great quality merchandise for an affordable price. Whether you are purchasing one of the graphic tees for yourself or as a gift for a teenager, you can rest assured you'll be getting high quality and excellent value.